King of the Franks, founder of the Carolingian dynasty which supplanted that of the Merovingians, and founder of the Holy Roman Empire in 800 e.v. as Charles I. Also known as Charlemagne, Karl der Grosse, and Carl the Great; he was the grandson of Charles Martel, “The Hammer,” with whom he is sometimes confused. 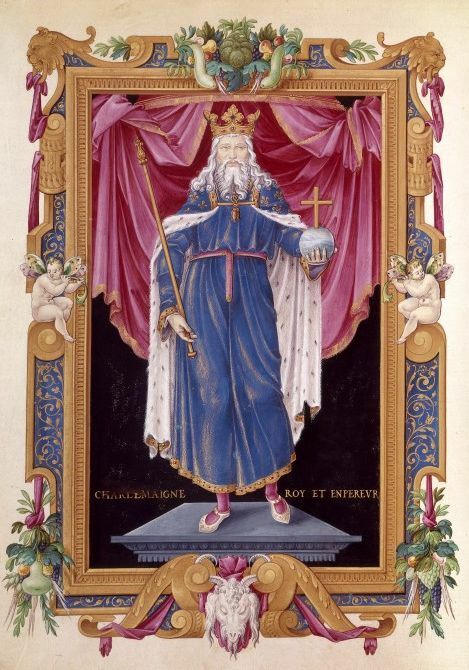 Charlemagne was a great conqueror, statesman and legislator, a pious christian and a patron of learning, and was one of the principle forces in the civilization of barbarian Europe. From his capital at Aix-la-Chapelle, now Aachen, in western Germany, he battled the Saracens of Spain, the Saxons of Hanover and Holland, and the Huns and Slavs of the East, ultimately uniting most of Europe in a single great state loyal to the Pope. He adopted as his ensign the double-headed eagle, symbolic of the reunion of the divided Roman Empire. He established an academy to oversee the development of schools throughout Europe, but the enlightenment of Charlemagne’s reign disappeared quickly after his death in the feudalism of his degenerate successors. Many romantic fables are told of Charlemagne and his paladins (or peers, his twelve most illustrious knights). The most famous of the paladins were Roland, or Orlando, favorite nephew of Charlemagne, of whom was written The Song of Roland as well as Orlando Furioso by the Italian poet Ariosto; Florismart, Orlando’s friend; Rinaldo of Montalban, Orlando’s cousin; Namo, Duke of Bavaria; Salomon, King of Brittany; Turpin, the Archbishop; Astolpho, of England; Ogier, of Denmark; Malagigi the Enchanter; and Gano of Mayence, who betrayed them.